Early risers this week will be treated to a spectacular display of planets and bright stars as Venus, Mercury and Saturn take center stage in the predawn sky. Half an hour before sunrise, three of the brightest planets will stretch across the eastern sky, further enhanced by the presence of two first magnitude stars, blue-white Spica and deep red Antares. 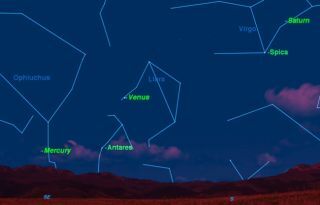 This sky map shows how Mercury, Venus and Saturn will appear before sunrise in the eastern and southeastern sky. The first object to attract your attention will be the planet venus, outshining everything in the sky except the sun and moon. In a small telescope, Venus will appear as a tiny half moon as it approaches its greatest apparent distance from the sun on Saturday, Jan. 8. Second in brightness will be the elusive planet Mecury, well below and to the left of Venus, close to the horizon. Do not confuse it with the red giant star Antares, almost directly below Venus. You may need binoculars to spot Mercury in the bright dawn sky. This is not a favorable apparition of Mercury because of the shallow angle that the ecliptic (the path of the sun through the sky) makes with the horizon. Mercury also appears in a telescope as a tiny half moon, with the greatest elongation being on Sunday, Jan. 9. Finally, above and to the right of Venus rides the planet Saturn, and, just below it, the brightest star in the constellation Virgo: Spica. In a telescope magnifying more than 25 times you should be able to see Saturn's famous rings, although magnification of around 200 times is needed to see the details. Whenever you view Saturn in a telescope, be on the lookout for its retinue of moons. Even the smallest telescope will show its largest moon Titan, and larger telescopes will show half a dozen more.